A blend of Pinot Noir and Merlot delivers an intense pink color with vigorous, crystalline and dense perlage that creates a fragrant creamy rose-colored froth. There are scents of roses, wild strawberries and red currants on the nose. This sparkling wine is well-balanced, full-bodied, pleasantly acidic, and mellow on the palate. It is wonderful as an aperitif but it also goes well with all dishes. It is a bold accompaniment either with savory appetizers or first courses with meat, or even for the more adventurous, with pizza! Enjoy well chilled. 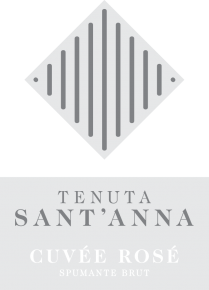 In late 2015 Tenuta Sant’Anna has introduced a new visual identity for its brand and its iconic prosecco is getting a make-over with updated label and bottle. Harvested grapes are de-stemmed and crushed gently. The must is transferred into steel vats for fermentation where it comes into contact with the grape skins that gives it a light coloring. Then it goes through second fermentation in steel tanks for at least 40 days.